Auto Defects « Carter Cromwell Law Firm, P.C. Cameron v. Isuzu, Fulton County State Court (2001) – Recovery for the family of a wife and mother, who was crushed when her SUV rolled over as a result of a defective suspension system. The case proceeded against the manufacturer for a manufacturing defect in the welds and the suspension system and a design defect for the roof crush of the Isuzu Trooper. Johnson v. Nissan, United States District Court, Northern District of Georgia (2003) – A passenger seated behind the driver and wearing a lap belt only was paralyzed in a frontal collision. The paralysis was caused by the lap belt sliding up to the abdominal area during the collision and causing excessive loads on the spinal column. This phenomenon is known as submarining and is well known to automotive industry. It is caused by defective design in the seat and seatbelt which do not allow the belt to fit properly and to stay on the hips during a collision. The case resolved prior to trial. Maddox v. Toyota, United States District Court, Northern District of Georgia (2003) – Recovery for the family of a woman killed in a low speed frontal collision due to the lack of structural crashworthiness. During the minor collision, the steering wheel moved rearward and upward causing the 53 year old woman to break her neck. Wright v. General Motors, Superior Court of Richmond County (2004) – Class action based on excessive and dangerous vibration in pick up trucks. The case was resolved prior to the class being certified by the court. Lindsey v. Navistar International $5.1 million dollar verdict for family of wife and mother killed by a truck with defective air brakes. This was a case of national importance. The trucking industry attempted to prove that federal regulations prevented the state law claim for injury. The case went all the way to the US Supreme court, who agreed with our client that simply meeting a federal regulation was no excuse for putting an unsafe truck on the road. Gentry v. Volkswagen, $11 million dollar verdict for death of 16 year-old. Settlement for Air Bag Defect for a passenger blinded by an air bag. The air bag was improperly folded at the factory. 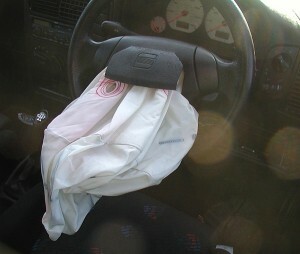 During a minor collision, the air bag deployed. Because it was not folded properly, a seam which should have been in the lap area hit her in the eyes, blinding her completely in one eye and partially in the other. Settlement for fuel system defect for husband whose wife and young children were burned to death when their car left the road and hit a tree. The car caught fire. The wife and children were trapped in the car. After the fire, the mother’s remains were found lying across the remains of the children as she attempted to shelter them from the flames. The car caught fire because the fuel lines were not properly shielded.